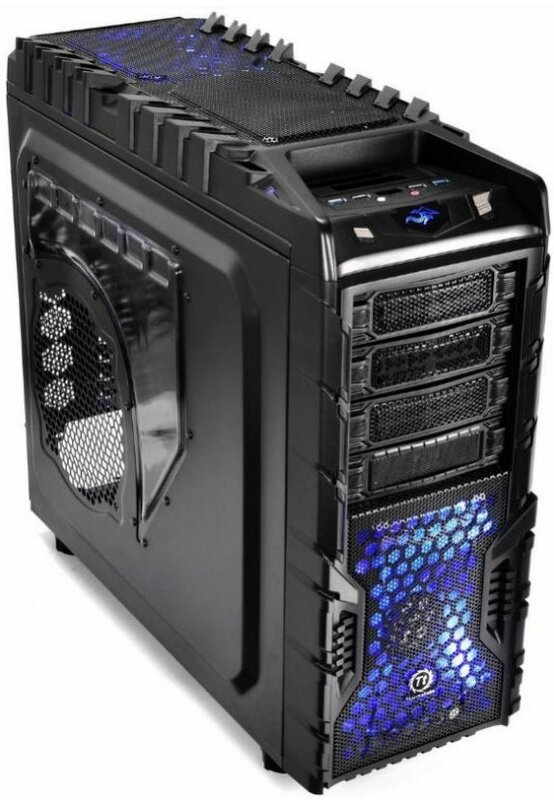 ThermalTake presents ths Overseer RX-I, a new full-tower steel case with an all-black design. Pricing is around 105EUR, full specs can be read over here. Thermaltake, the leader and pioneer in PC thermal solutions, a worldwide designer and supplier of high-performance components to the PC gaming hardware market, with “delivering the perfect user experiences” as our mission. The new Thermaltake Overseer RX-I e-Sports chassis’s global market launch commences in mid-September. The most invaluable full-tower chassis made for e-Sports fanatics to govern and benefit from all valuable resources while in or out of the game. It is an unprecedented e-Sports chassis that is designed for gaming purists looking for the ultimate gaming performance, ensure true enjoyment. The exterior of the new Thermaltake Overseer RX-I e-Sports chassis continues the breathtaking design idiom, and prominent stylistic features include its six of 3.5” hard disk and three of 5.25” optical disk tool-free drivers’ bays with an e-Sports gaming design chassis. The chassis itself is armored with two exquisite front bezel and top bezels with a distinguishable breath light effect present a tender e-Sports gaming sensation to e-Sports fanatics. Moreover, an extra large interior room with full black coating, smart cable management and bottom-placed power supply unit design that not only offer the flexibility to support extended ATX motherboards and the most advanced AMD & NVIDIA graphic cards up to 12.5”/34cm long (i.e. AMD Radeon HD 6990 & NVIDIA Geforce GTX 590) but also gives an unify overall appearance from inside to outside of the chassis. The Overseer RX-I e-Sports chassis geared up with internal USB 3.0 SuperSpeed and top-mounted HDD docking station which enables blazing fast file transfer and effortless hot-swap capability. Furthermore, four heighten foot stands with excessive ventilation designs plus the detachable front, side and PSU dust filer provide an clean air flow with excellent internal environment, allow e-Sports fanatics to bolt through games and battles without any hiccup. Last but not least, reserved holes for liquid cooling system, offer the versatility for overclocking fanatics who wish to push performance to the limit. No matter if you are just an ordinary e-Sports player or an extreme e-Sports fanatic, Thermaltake Overseer RX-I e-Sports chassis has all the abilities with affordable value to govern all your important resources that will boost your games to a whole new level!